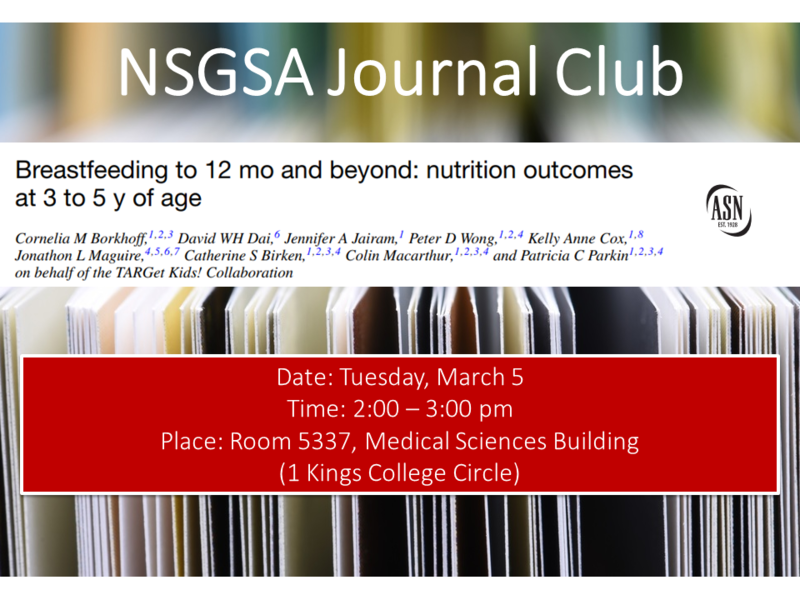 Join the NSGSA for our next journal club on Tuesday, March 5th! We will be discussing a recent article from the TARGet Kids! cohort on breastfeeding duration and nutrition outcomes in the preschool years. Citation: Borkhoff CM, Dai DWH, Jairam JA, Wong PD, Cox KA, Maguire JL, Birken CS, Macarthur C, Parkin PC; TARGet Kids! Collaboration. Breastfeeding to 12 mo and beyond: nutrition outcomes at 3 to 5 y of age. Am J Clin Nutr. 2018 Aug 1;108(2):354-362. doi: 10.1093/ajcn/nqy124.